It is quite clear that a flat fare is impractical on a broad geographic scale unless some combination of governments is prepared to greatly increase the subsidy both for fare revenue and for the additional service such a scheme would require to handle induced demand. The problem becomes just what do we mean when we talk about “distance” or “zones”, not to mention classes of service such as “premium express” or “rail vs bus”. In fact, even a simple analysis of GO fares reveals that this formula is at best a goal, not a rigourously applied scheme, and long trips are charged substantially less than short ones relative to distances. This has very serious implications for the proposed RER network that will lie substantially within the higher-cost portion of the network, and for any additional stops made possible through the higher speed of electrified service. Another problem is that RER will depend on local feeder-distributor services, and these must be available at a very low marginal cost over the train fares. Otherwise, the cost of a train plus local transit trip (let alone one using local transit to access GO at both ends of the journey) will be prohibitively expensive. Regional fare integration between the TTC and its neighbouring systems is very important, but this requires a scheme that will reflect that a shared fare will necessarily be lower than the separate fares now charged to cross-border riders. New riding might offset some of this, but that riding will also require more service and there is no guarantee that things will magically work out without more subsidy dollars. RER itself faces a challenge in operating costs, and by implication fares, in that it is a departure from GO’s past practices. Until now, GO adds a train here and there with the expectation that the seats will be full and fare revenue will come in at least on a par with existing operations. Only the recent move to a 30-minute service on the Lake Shore trains was a case of putting in service and hoping for the best. Ridership has gone up, but there has been no accounting of the net cost. RER includes a promised 15 minute all day headway on many lines, but there is no guarantee they will generate ridership and fare revenue to support this level of service. Will the balance come from better GO subsidies, or from fare revenue? On the TTC itself, we commonly hear calls for some sort of distance-based fare. These usually come from people whose trips cross existing fare boundaries, and who hope to see lower combined TTC+905 fare. However, there is a fact of life about TTC trips that must be considered: the average journey is under 10km, and if fares are rebalanced based on distance, then those who have long commutes will pay substantially more for the privilege of spending much of their lives on the TTC. A trip from northeastern Scarborough to downtown could easily cost twice or more the present TTC fare, and such long-haul trips on the TTC could be as expensive as comparable trips on GO Transit. 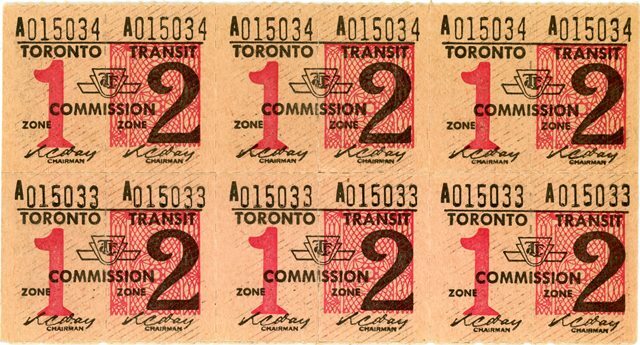 Toronto eliminated its zone fare system four decades ago precisely because of suburban objections to supporting the TTC through taxes, but getting worse service and paying more to ride a two-zone trip into the core. 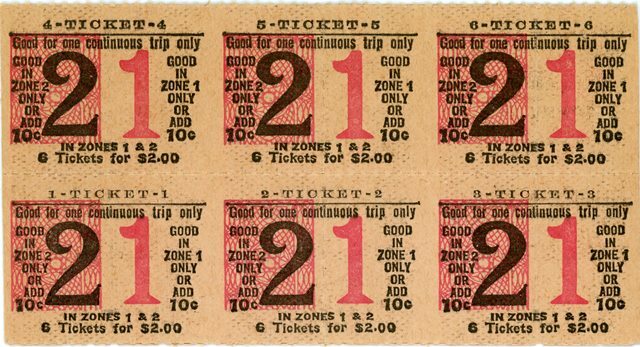 At a time when the single zone fare was 20 cents, the two zone ticket cost 33.3 cents. Some “suburban” subway stations were originally built with a fare barrier between subway and surface routes and these were reconfigured after the elimination of “Zone 2” to provide a transfer-free connection from buses to subway. On top of the question of zones, distance or time as the unit of measure for fares, there are a number of questions about concession fares. Who should receive discounts? How deep should these be? Should discounts be extended to classes of riders such as seniors and students, or to those of limited financial resources? 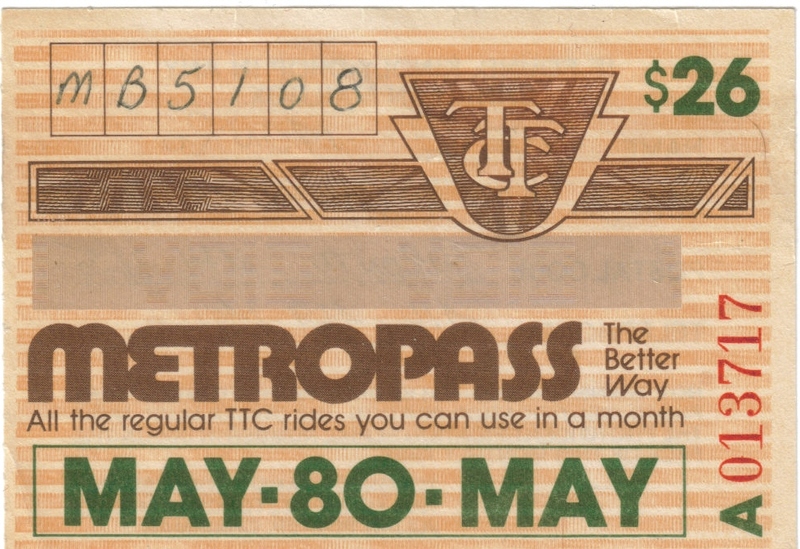 How will various discount schemes on the TTC, GO and the 905 systems be reconciled? Should any existing discounts be eliminated? What constitutes a “premium service”? GO Transit rail? GO Transit buses? Express buses on BRT routes? Limited stop buses running in mixed traffic? The subway network? Should there be fare premiums at all for the basic network, or should calculations of fare levels be the same for a GO Train to Hamilton as for a TTC bus to York University? Should fares reflect the capital investments in higher-order infrastructure, or of higher operating costs associated with rail modes, particularly those underground? These are not just straightforward matters of socio-economic analysis, but of political issues with a long history. Fare systems and revenues have developed over decades on each transit system as they have in other cities to which Toronto might look as potential models. The problem with any change is that what “works” in city “A” has been there for years and is part of the transit political landscape. People might not like fare by distance in, say, London England, but things have always been done that way. However, the degree to which the central city has become the preserve of the well-off raises issues about the affordability of transit in such cities for the transit captives who are likely to be forced into longer journeys as gentrification moves outward. It is easy to wave one’s hand (usually after lifting it briefly from a steering wheel) and pontificate about how fares should be reorganized, but coming up with a workable “solution” is quite another matter. If this must be done without any investment of general revenues to give some cushion to the elimination of fare “inequities”, then the task is almost impossible. It will provide great political theatre for those of us who enjoy watching insensitive, unthinking politicians being set upon by voters with torches and pitchforks, but this will not address the basic problem that cutbacks in public funding for transit over past decades leave no “wiggle room” to simply rebalance revenues among fare classes with little effect on most riders. Municipal and provincial politicians should give careful thought to this the next time they trumpet new investments in transit infrastructure. If riders cannot afford to use the systems built in the name of “fighting gridlock” and “improving the economy”, then their benefit will be limited. Then the riding would have to double to make up the difference.This is not exactly the situation the TTC wants on its already overloaded subway system. Surely there must be some routes where there is space for more than double the ridership. Say you institute free transfers between buses at designated loops e.g. Long Branch, Skymark, Islington/Steeles UTSC, Rouge Hill, and retain the extra fare on the Vaughan subway as a premium service. The bus routes (and the 501) serving the Toronto border aren’t usually full by the time they get there. I’m not sure the TTC buses going into York Region are particularly full either. The one time I was on the 107, there were two other people on and one pretended not to have any change to avoid paying the second fare. Steve: Three problems. First, you are backing away from a unified fare for the subway-bus combo (which is what my statement is based on) by suggesting that the subway become a premium fare service, an idea that has a raft of problems elsewhere in the network. As for routes that touch the border, they may be empty at the border (their terminal points) but they are not empty further along the line. This is just a variant on saying that the Yonge subway must have capacity because the trains are empty at Finch. Finally, TTC buses operating in York Region charge York Region fares and the revenue is used only to offset the subsidy York pays to the TTC. Any new riders here are York revenue (or with some form of integration, lost York revenue, not TTC revenue. Three problems. First, you are backing away from a unified fare for the subway-bus combo (which is what my statement is based on) by suggesting that the subway become a premium fare service, an idea that has a raft of problems elsewhere in the network. As for routes that touch the border, they may be empty at the border (their terminal points) but they are not empty further along the line. This is just a variant on saying that the Yonge subway must have capacity because the trains are empty at Finch. Finally, TTC buses operating in York Region charge York Region fares and the revenue is used only to offset the subsidy York pays to the TTC. Any new riders here are York revenue (or with some form of integration, lost York revenue, not TTC revenue. True, and I agree especially that a zone II Vaughan subway is a silly idea and that my idea is fairly contrived to get around the capacity issue. (The Vaughan subway itself is a silly idea but I guess that’s not what we’re talking about.) Perhaps I am being simple minded but I feel like to implement free transfers is a relatively simple task, predicated on the notion that ridership will grow. Implementation-wise all you have to do is tell the bus drivers to accept other agencies’ fare media and count your own revenue. The money? Tricky. In the nascent stages of implementation both agencies will lose revenue and approach overcapacity faster. Difficult to swallow in this economy and era of public works divestment. You could start by offering 75¢ transfers or Metropass stickers (co-fare, I suppose), say, to offset some of the revenue but money would have to be borrowed. QP/Fed don’t seem keen on increasing our allowance at all so asking for money for a new pet project seems like a long shot and QP would probably try to throw their precious presto into the mix. However, as far as loans go this seems like a safe bet. Scrape together the cash to complete projects quickly that will relieve pressure on YUS and BD and handle new demand while telling the bank, look how many Mississauga riders are waiting to board the new trains. I’d bet on it before I bet on the Scarborough subway anyhow. Steve: There is an interesting parallel here to the Gardiner East debate. For the Hybrid expressway scheme, we are told that investing money (our own, not Federal or Provincial handouts) in a more expensive scheme is a “good thing” because of the allegedly greater benefits. However, the idea that we would “invest” by raising taxes to cover the cost of fare unification and/or better service runs headlong into the “no new taxes” brigade even though there are clear benefits to removal of fare boundaries and improvement of mobility with better service. There is a double standard when talking about costs, benefits, and the types of expenditure that are magically immune to debates about tax implications. It is important to remember that many perceive driving as a right and transit as a service. Somehow, although driving is a recent invention, it has completely taken over the concept of mobility in many people’s minds. This is also reflected in how people perceive bikes on roads, in that somehow for many drivers they should not be there, even though under the law they are vehicles, and are not permitted on the sidewalks. There is a substantial group that does not see biking as fitting the same basic mobility need (right), and is somehow an affectation, even though it is often a more socially responsible way of creating personal mobility. This is a classic issue, of how people will in essence take how something is done during their lifetimes, and assume that this is the only choice, the right choice, without even realizing there are options, and that using a recent invention does not constitute a basic human right. There is a double standard when talking about costs, benefits, and the types of expenditure that are magically immune to debates about tax implications. I’m not trying to be disingenuous here. I understand that the money has to come from somewhere and that even if the TTC were to take on debt to complete the project, there would likely be some sort of tax to raise money for leverage. I was moreso trying to say that people are making this issue more complicated than need be (QP/GO included) by trying to spend as little as possible (Or Zero) on what is actually a very worthy cause. “There is a double standard when talking about costs, benefits, and the types of expenditure that are magically immune to debates about tax implications. I think that – yes there is a double standard, however there have been few major road projects within the city either. There seems to have been a hope that the can, can be kicked further down the road. When the LRT project was stopped in Scarborough these forces kicked in big time. Yes there is huge political pressure to build subway – but I suspect there will be full measure of delaying tactics. @Giancarlo – of course the interesting thing is the practical aspects of what can be reasonably built, supported and will best enhance the value of the neighborhood yet to be built, do not really enter into the political equation. The balance/tension between governance, and politics, has been pushed a long way towards politics for a good long time, and to some degree that is our fault as voters. When we see someone actively stoking our desires and saying what we want to hear, we really do need to learn to ask ourselves whether this makes sense and is a good course of action or merely a way of getting elected. Especially as questionable ideas, once well enough sold and placed in the popular mind, are very hard to back away from. Having said this, the proposed SmartTrack would be a welcome update and replacement of the existing GO lines, but for those that are not making use of the current GO trains along those routes, SmartTrack will not make that much difference. Proper rapid transit is long overdue for Scarborough. Upgrading existing GO lines to a SmartTrack without first extending the subway into Scarborough is simply not acceptable. If funding is limited and they have to set priorities, the existing Go lines should remain as is for now; and the Bloor/Danforth relief line, and the Scarborough subway, should take precedence. Steve: The problem is that as things now stand, there is not enough capacity for both Smart Track and GO Transit’s RER scheme to co-exist. Metrolinx seems to be treating them as synonymous, and this does not bode well for the badly conceived Eglinton West branch which really should have gone to Bramalea. The sooner Tory ditches the amateurs who are doing his transit planning, the sooner we can have some intelligent conversations about how everything will fit together.